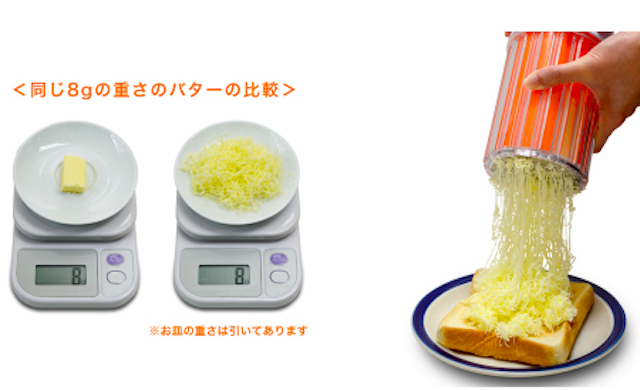 Today I’d like to introduce a unique kitchen tool: “Easy Butter”, marketed by a Japanese company, Metex. Just insert a lump of butter into Easy Butter, rotate the body mechanism and voila! Out comes butter in long threads. Look at the above photo. The butter appears like angel hair pasta or threads all tangled up! What fun! Simply put, what a grater is for cheese, Easy Butter is for butter. Butter in this style has very airy texture, melts quickly on a toasted bread slice and is very easy to spread. What’s more, the butter takes on a richer flavor with so much more surface area. And the best part of Easy Butter is that it satisfies with a smaller quantity of butter per serving and thus fewer calories! This must be a very helpful device for people who care about their weight and health. Are you interested in Easy Butter? 😉 The price is ¥2,455 (US$23.60). Hmm, I personally think that the price point is kind of high for me because I don’t use so much butter in my daily life. But for those who use butter routinely, the Easy Butter looks to be fun and economical. If it was only around ¥1,000 (US$9.60), I would buy it myself!! Maybe I should use more butter. [Photoblog] Do You Know the Word of “Moe-sha”? Japanese Team Challenges GUINNESS for Huge Mosaic Art !! !